A refreshing and invigorating way to cool down this summer. 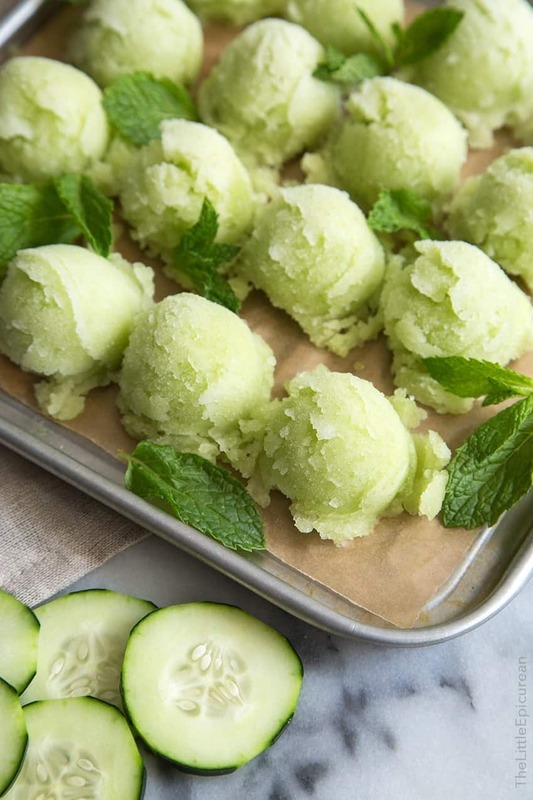 This 3-ingredient cucumber sorbet is a definite summer staple! If I could, I would go to the spa every morning. I’d get a massage, maybe a facial or a body wrap. And then I would lounge for an hour or so listening to calming instrumentals while sipping on a giant glass of cucumber water and thumbing through food magazines. That sounds absolutely perfect to me. While going to the spa every day is a luxuriously ridiculous and ludicrously expensive habit (especially given LA’s high prices), I will happily settle for an endless supply of cucumber sorbet. 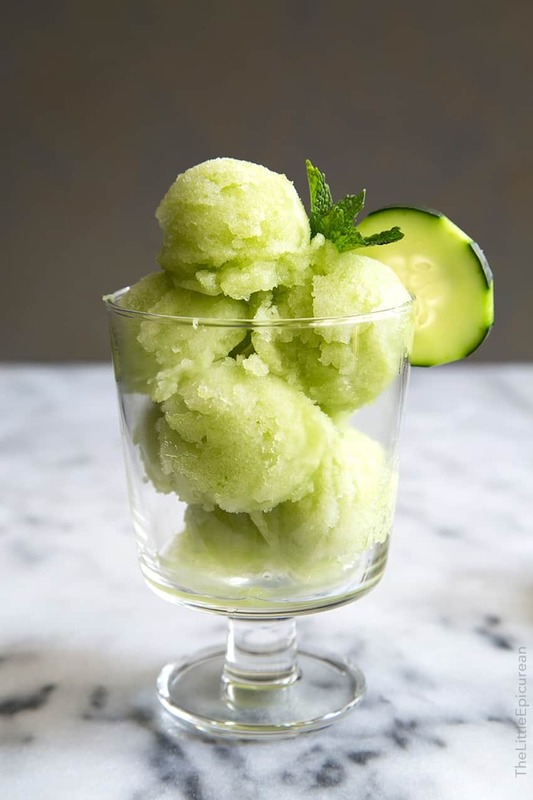 With this sorbet in hand, I’ll be cool as a cucumber and happy as a clam all summer long. 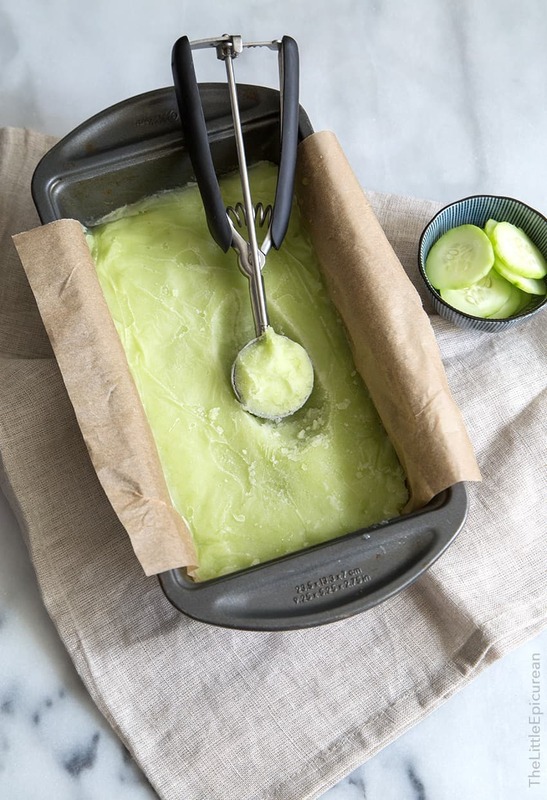 The beauty of this cucumber sorbet lies in its simplicity. It only requires three ingredients: cucumber, lemon juice, and sugar. If you can find seedless cucumbers, go for it. Otherwise, simply scoop out the seeds like in the photo above. Don’t be alarmed by the amount of sugar in this recipe. Sugar content is a key factor in sorbet making. Too little sugar, you’ll end up with an icy sorbet that’s more like a granita. Too much sugar and the sorbet won’t freeze properly. In culinary school, we used a refractometer to measure the sugar content in our purees for sorbets. We were also taught the egg test in which you place a clean egg into the fruit puree to see how far the egg sinks into the liquid. It’s all very technical and scientific as sorbets need a certain amount of sugar to freezer properly. The amount of sugar determines the size of ice crystals that will form- meaning whether your sorbet will be coarse or creamy. 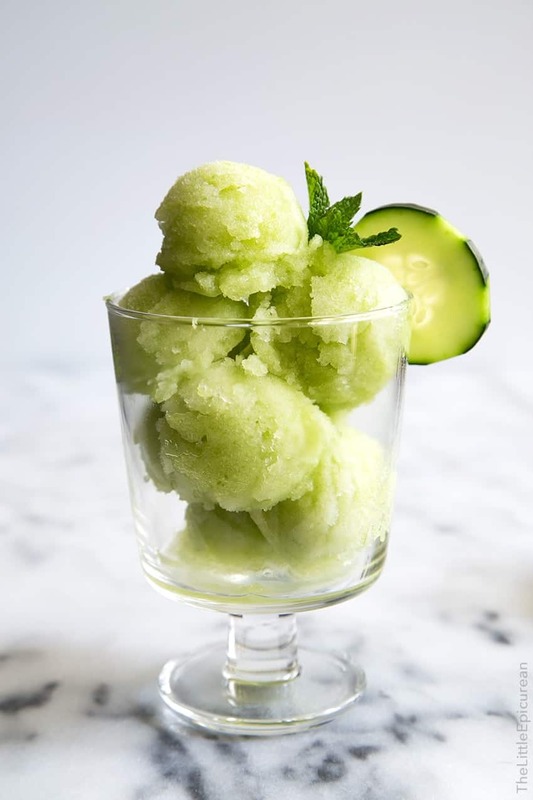 I had so much fun making this cucumber sorbet that I’ve decided to make an entire series of fruit sorbets this summer. Best of all, I’ll be using the sorbets to make boozy floats. Stay tuned, next week I’ll be sharing cucumber gin and tonic floats! Perfect for pool side lounging or happy hour with friends! For more sorbet recipes check out: orange sorbet, blueberry sorbet, strawberry blackberry sorbet. 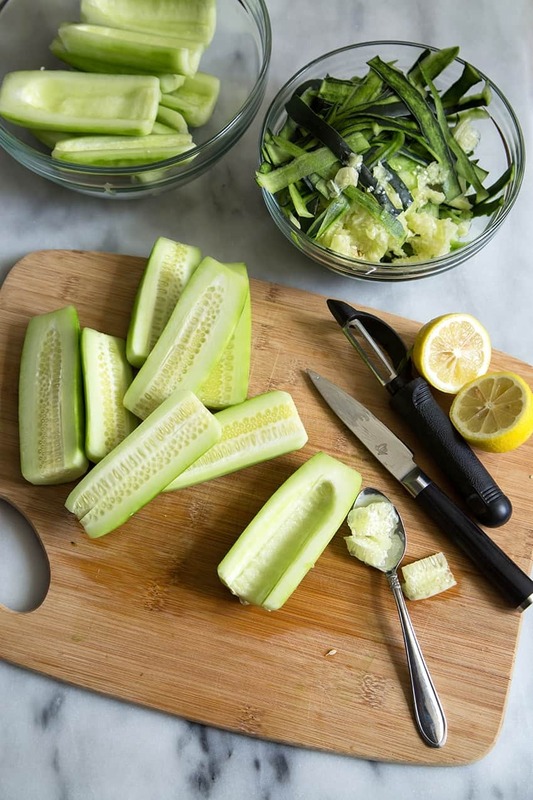 Peel cucumbers and remove seeds. Cut into 2 inch pieces and place in a food processor along with lemon juice and sugar. Process until mixture is smooth. Freeze mixture in ice cream maker according to your unit's instructions. Process until the mixture has reached a soft serve consistency. Transfer to a freezer-safe container and let rest in the freezer for at least 4 hours before serving. Allow to sit at room temperature for 5 minutes before scooping and serving. Garnish with fresh mint when serving. *1 1/2 pounds is the weight after peeling and seeding the cucumbers. i love how refreshing this sounds!! and i’m down for anything and everything that makes me feel zen-like and as if i’m at a spa. Cups and pounds? Can we have this in grown-up measurements please? Yes, it tastes like slightly sweetened cucumbers. I hope your FIL enjoys the recipe! Sounds wonderful, but I don’t have an ice cream maker. Will it set up somewhat if I just put it in the processor then freeze it?